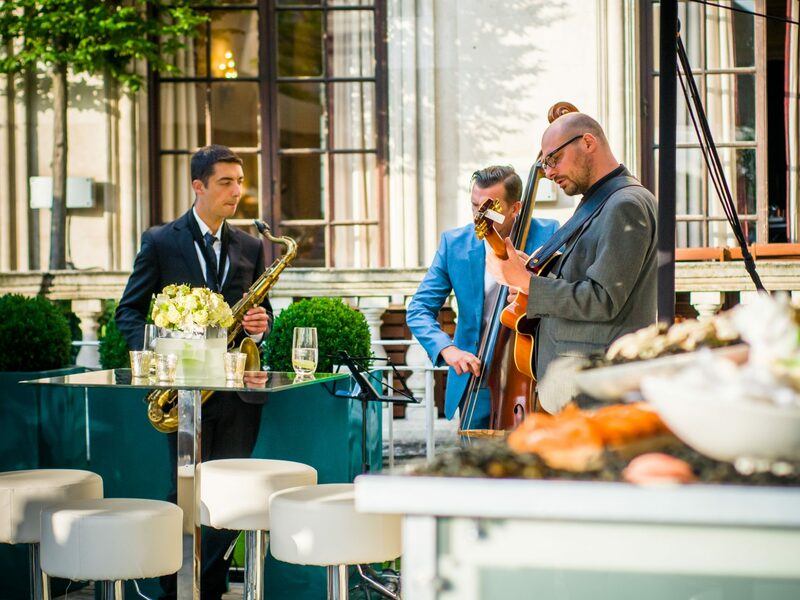 The Admirable Crichton’s top tips for hosting a sensational summer party. Here at the Admirable Crichton, we have been enjoying a busy summer of garden parties and sizzling BBQs. We wanted to share with you some of our favourite ideas and most popular client choices to give your party that special touch of AC magic! Buffets and BBQ’s are always popular for summer parties due to the informality and flexibility they offer. For home parties, we suggest filling small bowls with small portions of Swedish meatballs, mashed potato and lingonberries, or fish and chip cones with tartare sauce. You can see the AC versions in the images above. Salads are always popular too; keep them simple but try something unusual, like watermelon, feta and basil. Cheeses and fresh fruit are always winners too. Decorate your table by adding height with wood, clear boxes or books, adding terracotta pots of herbs and plants or glass bowls filled with citrus fruits or chillis. Summer puddings should be light and easy to make and eat. Our clients love our lemon syllabub, marsala, mascarpone and berry compote. However, here is a super quick, tried, tested and loved home version. Mix 1 tub of creme fraiche, a large pot of whipped double cream, a large jar of good quality lemon curd, with the grated zest of 2 lemons. Add a little of the lemon juice for an extra lemony flavour. Serve in glass dishes or cocktail glasses with small lemon slices on top or with a little berry compote as in this image. With the lighter and warmer evenings upon us, we can finally enjoy the garden and what better way to enhance the space than to add creative lighting, elegant furniture and to fill the air with the fragrance of freshly cut British flowers. It’s finally time to bring the indoors outdoors! Festoon lights are an efficient and simple way to light outdoor areas, looped into trees they create informal and welcoming backdrops to your party. To offer some contrast, add paper lanterns either in pastel tones or go all out with bright tropical colours. They are very effective dotted around the party space or grouped into clusters of various sizes. Another idea is using bunches and bunches of twinkling white lights. These can be easily threaded into a large tree, making a real statement and centre piece for the evening. For a more modern and angular look, we would suggest the use of bright, white LED cubes dotted around the garden space. Gone are the days of using individually designed garden furniture. There is no reason why you shouldn’t use interior furniture outdoors. Guests should feel comfortable and relaxed with elegant coffee tables, huge vibrant, patterned cushions on stylish sofas and beautiful chairs crafted from textured, natural materials. Biscuit and ivory tones mixed with electric blue create a nautical look that is highly popular this summer. Don’t forget to have on hand a pile of luxurious blankets and pashminas for when the sun finally sets. Look for high-fragranced British cut flowers mixed with lots of interesting foliage to perfectly set off your tables. The finished look offers a more natural design, completely at home in any British garden. The great news is there is so much choice in mid-Summer, think about lavender, cornflowers, delphiniums, sunflowers, sweet peas, or roses. Accompany floral designs with clusters of t-light candles. For a cool and refreshing drink on a hot summer’s day, a watermelon martini will always hit the spot. A simple blend of watermelon juice, sugar syrup, lemon juice, vodka and a watermelon slice to decorate. You could even add a little melon liqueur if you happen to have some. Perfect.